There are only a couple of hours left in 2011 in New York and it is already the new year in many parts of the world. Let me spend my last post for this year, looking back at the year that was and looking forward to the year to come, using a few of my favorite market props: cash flows/earnings, market prices, risk free rates and risk premiums. It was a good year for earnings at US companies, with earnings on the S&P 500 companies rising about 16%. That makes what happens to stock prices a little puzzling, since the S&P 500 index started the year at 1257.64 and ended the year at 1257.60. As a result , the aggregate PE ratio for the index declined from 15.03 at the start of the year to 12.96 at the end. It was an even better year for cash flows: dividends on the S&P 500 companies rose 12.5%, but buybacks surged more than 80%. 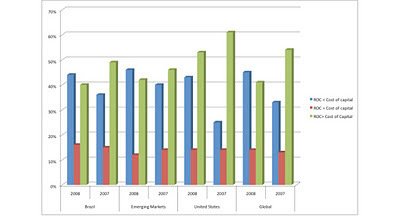 The total dollar buybacks in 2011 (at least for the four quarters ending September 2011) almost matched buybacks in 2006, though they still remained well below the historic highs set in 2007. While the dividend yield on the index remained anemic (2.07%) the total cash flow (including buybacks) yield on the index was 5.90%, again well above the ten-year average of 4.72%. The ten year treasury bond which started the year at 3.29% ended the year at 1.87%, the first time it has ended a year at below 2% in the last 50 years. The drop in the rates also made US treasuries one of the better investments for the year, with the ten year bond returning 16.04% for the year; the price appreciation component accounted for 12.75%. Ironic, don't you think? After all, this was the year of the great S&P downgrade of the US sovereign rating that I talked about on my summer vacation in August. Are lower interest rates good news? I don't think so and I posted on the point earlier this year. 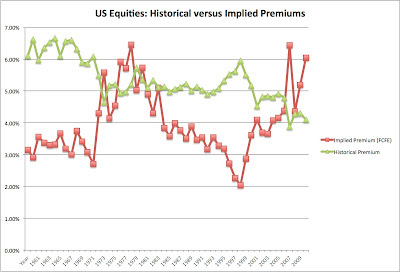 As many of you know, I have been estimating an implied equity risk premium for the S&P 500 for a long time, annually until 2008 and monthly since September 2008. I back out the premium using the level of the index and expected cash flows in the future. The premium started the year at 5.20%, surged during the summer to hit a high of 7.64% at the end of September and ended the year at 6.04%. The fact that stocks were flat for the year (the return with dividends was 2.07%) had the opposite effect on the historical risk premium (where you look at the difference between annual returns on stocks and treasuries over long periods of past history), with the historical risk premium dropping to 4.10%. 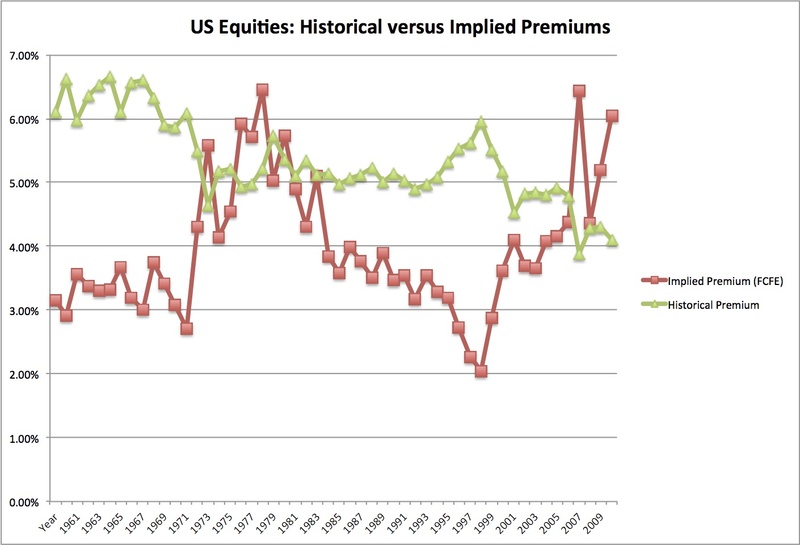 After a long period (1981-2007), where historical risk premiums exceeded implied premiums, this is the fourth year in a row that implied premiums have exceeded historical premiums. So much for last year! What does all this tell us about next year? It strikes me that the numbers are sending discordant messages. The earnings and cash flows point to a recovery, at least in corporate earnings, the treasury bond market is awfully pessimistic about future growth and the stock market vacillates between euphoria and despair. I really have no idea what next year will bring, but I am willing to make a guess. I expect the treasury bond market to grudgingly acknowledge higher economic growth prospects and move up (to 3%), equity risk premiums to become less volatile and move back towards lower numbers (5-5.5%). Buybacks and dividends will stay strong but will stabilize and earnings growth will moderate. The net effect will be to make the stock market a more hospitable place to invest and the bond market a less attractive investment. So, I am adding to my equity exposure, selling my treasury bonds and praying that the Eurozone does not turn my predictions to dust. I apologize for both the US-centric and macro nature of this post but I am starting on my annual data update this week. Over the next ten days, I will be exploring the raw data that I have downloaded on 50,000+ companies globally, since the close of trading yesterday, and will be generating my industry average tables. During that analysis, I will be looking at how equities have moved globally and world-wide trends in both valuation multiples (PE, Price to book, EV/EBITDA etc.) 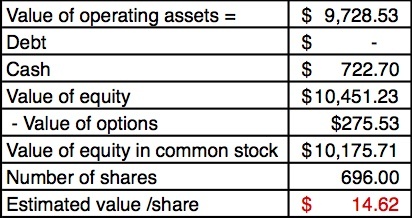 and corporate finance variables (dividends, debt ratios, returns on equity/capital). I will have a much more detailed post when I am done but I look forward to learning a great deal more from the numbers than from listening to expert prognostications. So, happy New Year! I wish you, your families and your loved ones the very best for the coming year! Be happy and healthy! This morning's New York Times has an article from one my favorite business writers, James Stewart, on Amazon. His focus, largely admiring, is on the fact that Amazon has made decisions that hurt it in the short term but create value in the long term. To provide at least two examples, he talks about Amazon's decisions to cut prices on products and go for a larger market share and to invest in in the Kindle, their book reader. The tenor of the article is that the market has short sightedly punished the company for its long term focus. 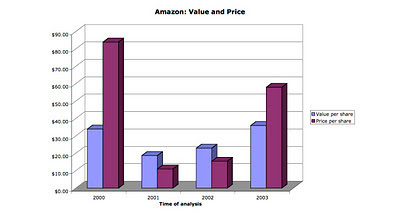 Stewart uses one piece of anecdotal evidence to back up his claim that markets are short term: the stock price reaction to the earnings report on October 25, when Amazon announced earnings and revenues that were largely as expected but announced that it had been spending a great deal more than investors thought it had to deliver that growth. I am no knee jerk defender of financial markets and accept the fact that markets not only make mistakes in assessing value, but also that a subset of investors are short term and over react to earnings announcements. In fact, I am sure that there are companies that you can point to that have been unfairly treated by markets for their long term focus (and other companies that have been unfairly rewarded for delivering short term results at the expense of long term value). I just don't think Amazon is the example I would use to bring this point on. Let's start with some general facts. Here is how the market has and is continuing to punish Amazon for its long term focus. In the last decade, Amazon has seen its market capitalization increase from $4.55 billion in 2001 to $82 billion in 2011; the market cap for Amazon at the peak of the dot com boom was only $30 billion. An investor who bought Amazon stock in 2001 would have generated a cumulated return of 1300% over the last 10 years. In November 2011, after the earnings report that Mr. Stewart alludes to, Amazon was trading at 96 times trailing earnings and at two times trailing revenues. 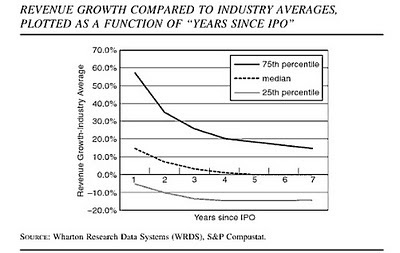 In contrast, the median PE ratio for a retail firm was about 15 and the median EV to revenue multiples was 0.8. By my estimate, Amazon is one of the most richly priced large retailers in the world. Over the last decade, the firm has made multiple bets on growth and asked the market to trust it to make the right judgments. For the most part, its actions have been welcomed by markets that have been willing to look past disappointing earnings reports at the future. 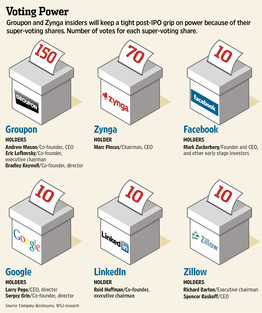 Jeff Bezos is celebrated as a great CEO, with comparisons made to Steve Jobs. So, why was the market reaction to Amazon's last earnings report so brutal? As someone who has valued Amazon almost every year since 1998, I think I can provide some historical perspective. Amazon has been, at alternate times, revered and reviled by financial markets. In January 2000, at the peak of the dot com boom, based on my estimate of value for Amazon at the time, it was over valued by about 60%. A year later, based again on my assessment of value, it was under valued by about 50%. During the 12 years that I have valued the company, it has been overvalued in 7 of the years and under valued in 5 of those years. Since the beginning of 2009, notwithstanding the reaction to the last earnings report, investors have been on their manic phase with Amazon, pushing the stock price up more than 300% (from $54 to over $200). At its price of almost $200/share, just before its October earnings report, Amazon was valued to perfection and beyond. In fact, for it to be worth $200/share, it would have to deliver about increase revenues to more than $200 billion in ten years, while increasing its pre-tax operating margin from 2.5% to 4%, while generating a return on capital of 70%+ on its new investments. If you disagree on these assumptions, feel free to change them for yourself in the attached spreadsheet. It is the last item that I would draw your attention to, because the last earnings report was a sobering reminder that while Amazon will continue to grow, the growth is not going to be easy or cheap. In my view, the market is still much too optimistic about the quality of Amazon's growth going forward and I think it remains over priced. In Mr. Stewart's world, that would make me a short term investor, but not in mine. At the risk of repeating a theme that has run through my posts for the last few months, growth has value only if it is delivered at a reasonable cost and a growth stock is cheap only if the market price reflects that cost. Amazon does not look cheap to me, even with a great CEO and a long term focus! I have a sixteen-year old daughter who calls me "old man" and while I know she is using the term lovingly (of course.. I believe the best about my kids), the moniker still strikes home as a reminder that I am older and that age brings limits that I can choose to ignore at my own peril. I know that I can no longer go to bed late and get up early, that I have to watch what I eat and that I need my reading glasses to read restaurant menus. As I watched Research in Motion (RIM) go through painful contortions in the financial markets yesterday, I was reminded that companies also go through an aging process, and how they deal with the limits that come with age determines their value to investors. 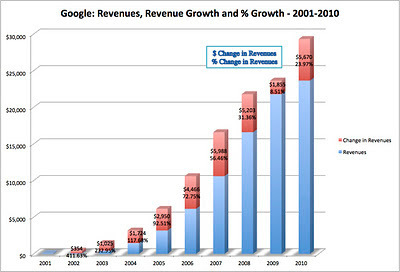 RIM has had a pretty good run as a company, but they have a problem. Their core technology which powers the Blackberry is a cash cow but it is one that faces corrosion in market share, as smart phone users turn to Androids and iPhones, with their more open operating systems and extensive app libraries. As the CEO of RIM, you have two choices. Go for growth: You can invest hefty portions of the cash flows from your core technology back into the business in R&D and new products, hoping for a breakthrough, but you are competing against two companies, Apple and Google, that have more resources and imagination than you do. 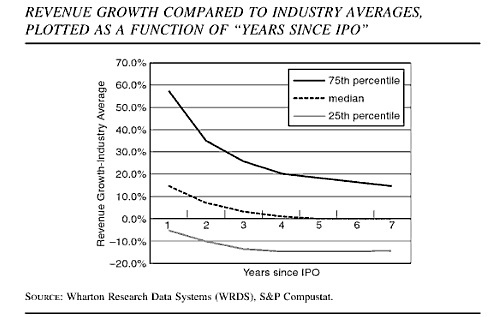 You may be able to eke out growth but the amounts you would have to reinvest to generate that growth may make it a losing proposition for your stockholders. Go for cash: You can accept the reality that you have a product with a limited life but solid cash flows. You invest just enough to keep this product on its feet and a cash flow generator for the near future, and give up on new products and technologies. You also change your capital structure and dividend policy to reflect your new status as a limited life, cash cow: use more debt in your financing and you return more of your cash to stockholders as dividends or stock buybacks. You are, in effect, liquidating yourself over time, and while your stock price will approach zero by the end of the Blackberry's life, your investors would have collected enough cash flows not to care. So, what are the value implications of your choice? In the fiscal year ended February 2011, RIM reported pre-tax operating income of $4.6 billion and net income of $3.4 billion, but this income was after R&D expenses of $$1.4 billion. While their earnings has plummeted in the last two quarters (operating income in the 12 months ended November 2011 was down to $3.4 billion), and some of the drop can be attributed to a loss of market share for Blackberries, the drop was accentuated by losses on new products such as the Playbook tablet. In fact, let's be conservative and assume that the operating income in 2012 will come in at less than $ 2.5 billion and that RIM, if it gives up on developing new products, can cut $ 1 billion out of R&D. (The remaining $400 million or more can go to maintaining the Blackberry Franchise). That would translate into a base pre-tax operating income of roughly $ 3.5 billion and after-tax cash flows of $3 billion. Assume further that you can milk the franchise for five more years, losing 20% of your customers each year. On an after-tax basis, using a tax rate of 30% and a cost of capital of 9% (which is the cut off for the top quartile of US companies), you get a value of about $8.125 billion. 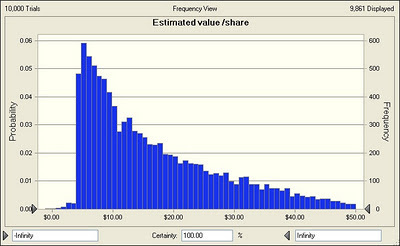 At its current market capitalization of $7.3 billion and enterprise value of $ 6 billion, that would make RIM a bargain (under valued by about $2 billion). In fact, make your own estimates and judgments, using this spreadsheet. So, what can go wrong? If managers continue to operate under the delusion that they can recreate their glory days and invest on that presumption, they can very easily wipe out the $ 2 billion difference. In fact, I think that the market is building in the expectation that RIM will continue not to act its age, investing as if it were a growth company, whose glory days lie ahead of it. As a potential stockholder in RIM, here is my unsolicited advice to the management of the company. Rather than fight the critiques of your product (that it is closed, corporate and limited), embrace them. In fact, I have names for your next few models: the Boring Blackberry, the Blackberry Funsucker and the Blackberry Stolid. Let's face it! The primary market for Blackberries is composed of paranoid (often with good reason) corporate entities that worry about their employees revealing business secrets and playing games on their iPhone and Android Apps, and you will appeal to them with your "cant have fun with these" Blackberries. Disband your research and development teams, forget about product revamps and don't even dream about more Playbooks. In effect, accept that you are an "old company" and behave like one. Your stockholders will be deeply grateful!